Groundwater Futures in Sub-Saharan Africa (GroFutures) will develop the scientific evidence and inclusive groundwater management processes by which groundwater resources can be used sustainably for poverty alleviation in Sub-Saharan Africa (SSA). It will improve understanding of the volume and renewability of groundwater in SSA, and develop robust models and tools to forecast available groundwater resources under changing climate, land-use and demand scenarios, including expansion of arable land under irrigation. GroFutures will examine current groundwater governance processes and identify pathways toward more sustainable and equitable use of groundwater resources that are reconciled to projections of changing demand and resource availability. It will assemble an international consortium of scientists with an unmatched track record of groundwater research and stakeholder engagement in SSA that both leverages substantial additional investment and engages with research and development communities across Anglophone and Francophone Africa. GroFutures will also establish a Network of African Groundwater Observatories that representing the primary groundwater environments and development governance challenges in SSA that features a new dataset of 25 records of groundwater-level observations that are 2 to 6 decades duration from across SSA enabling the most rigorous analysis of the relationships among climate, land-use and groundwater recharge that has ever been conducted in the tropics. Dedicated basin observatories will be constructed that will enable very detailed monitoring of the physical process by which groundwater is replenished and application of a new method for quantifying the volume of groundwater in African aquifers thereby overcoming fundamental limitations in present knowledge of groundwater in SSA. GroFutures will also employ an innovative and participatory approach to the management of groundwater which will enable for explicit consideration of the views of poor people in making decisions over the allocation and development of groundwater resources. Nearly 100 million people across several south and southeast Asian countries are currently exposed to elevated arsenic (As) concentrations in their drinking water supply (>10 µg/L - the World Health Organisation standard). The public health impact of As contamination in the shallow (<100 m below ground level) groundwater of Bangladesh, the most severely affected country, has been recognised as the worst case of mass poisoning in human history. In Bangladesh alone the health of more than 50 million people is threatened by chronic consumption of unsafe levels of As. Whereas hand-operated tubewells pumping shallow groundwater across the delta plains in the Bengal Basin are widely contaminated by As, the deeper (150−350 mbgl) groundwater is generally As-free. In order to reduce the widespread impact of As contamination on public health, high-yielding deep wells have been installed recently in more than 100 rural areas in Bangladesh. However, these deep tubewells may be vulnerable to invasion by As from shallow levels under the vertical gradients imposed by intensive pumping. The security of alternative pumping scenarios, especially the balance between pumping for irrigation and for domestic use, is of concern to water supply authorities. To address this sustainability issue, groundwater pathline analysis using the particle-tracking method has been applied at basin scale across the entire Bengal Aquifer System. We are applying a recently developed groundwater flow model of southeast Bangladesh. We apply the model to test the security of alternative groundwater pumping strategies at six provincial towns in southeastern Bangladesh (see figure on the left panel), with a combined population of approximately 350,000. Following consultation with authorities in Bangladesh, we apply three criteria to judge the security of deep (200 mbgl) groundwater abstraction scenarios against ingress of As. Abstraction is classified as secure (1) if deep groundwater is primarily recharged from As-safe basin margins or areas where As concentrations are low (<50 µg/L); (2) if deep groundwater is ultimately recharged from areas of high (>50 µg/L) As concentrations, but the groundwater travel time from recharge to abstraction is >100 years; and (3) in either of these cases, if deep groundwater pumping does not lower the shallow (<50 mbgl) groundwater level below 12 mbgl. The project reports long-term (1990 to 2007) linear trends in groundwater levels in north-central parts of Bangladesh with a particular interest in Dhaka City. 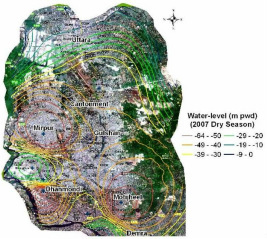 Trends and recent dry-season (2007) groundwater levels are mapped using GIS techniques that show greatest decline (−3 to −1 m/year) in and around Dhaka City. Declining trends are greatest in Dhanmondi, Mirpur and Motijheel areas in the city associated with highest built-up. In these areas, dry-season (2007) groundwater levels occurred at an elevation of <−50 m (public works datum or approximately the mean sea level). 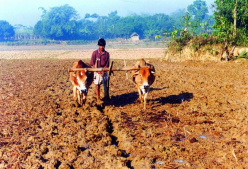 Declining water levels in north-central part of Bangladesh are direct result of intensive groundwater-fed irrigation for dry-season rice cultivation, and increasing water supplies for domestic and industrial uses in Dhaka city since early 1980s. Recently, groundwater is essentially drawing from aquifer storage since the current annual abstraction of 700 million cubic meters (MCM) is greater than the mean annual recharge of approximately 350 MCM. Further abstraction will lead greater decline in groundwater levels and storage, and ultimately make the city vulnerable to environmental catastrophes, particularly land subsidence and poor water quality as greater cone of depression in water table will induce recharge from polluted lakes and river channels, and neighboring regions where groundwater is contaminated with elevated arsenic. ﻿This project reports groundwater recharge to alluvial aquifers in Bangladesh and compares actual recharge to previously estimated potential recharge at the national scale. Over a period (1975 to 2007) during which groundwater abstraction increased dramatically in South Asia, changes in net groundwater recharge in Bangladesh are assessed using the water-table fluctuation method. 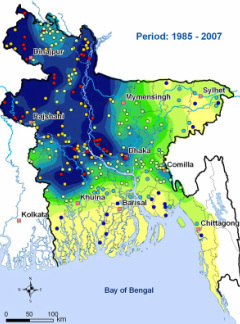 Mean annual groundwater recharge is shown to be higher (300 to 600 mm) in northwestern and southwestern areas of Bangladesh than in southeastern and northeastern regions (<100 mm) where rainfall and potential recharge are greater. Net recharge in many parts of Bangladesh has increased substantially (5 to 15 mm/year between 1985 and 2007) in response to increased groundwater abstraction for irrigation and urban water supplies. In contrast, net recharge has slightly decreased (−0.5 to −1 mm/year) in areas where groundwater-fed irrigation is low (<30% of total irrigation) and where abstraction has either decreased or remained unchanged over the period of 1985 to 2007. The spatio-temporal dynamics of recharge in Bangladesh illustrate the fundamental flaw in definitions of “safe yield” based on recharge estimated under static (non-pumping) conditions. New estimates also highlight the fact that areas where further groundwater abstraction may increase actual recharge to the shallow aquifer. This project also reveals areas in Bangladesh where current rates of groundwater abstraction for irrigation and urban water supplies are much greater than actual recharge and thus further development of groundwater in these areas (e.g., Dhaka City, Barind Tract) is unsustainable. 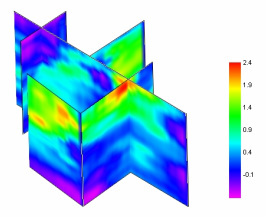 3D distribution of groundwater arsenic in Bangladesh. Scale shows in log μg/L of arsenic concentrations in aquifers. Groundwater is an important natural resource with high economic value and social significance. Estimates show that freshwater represents about 2.5 percent of all of the Earth's water content of which 30 percent is groundwater and the rest includes ice and glaciers, surface water, and soil and atmospheric water. Less than one-fifth of the Earth’s freshwater resource can be found in South Asia – a home to about 1.7 billion people. Although surface water is ubiquitous in South Asia a vast amount of freshwater is stored as groundwater that occurs predominantly beneath the densely populated floodplains of the Ganges, Brahmaputra and Indus river systems. For a large part of South Asia groundwater provides domestic, industrial and irrigation water supplies. A safe and sustainable water supply is essential for improving public health, and achieving economic growth and food security. Currently, groundwater resource is facing a multifaceted problem as a result of over exploitation, mismanagement, natural and anthropogenic contamination, and climate change.